Whether you’re a daily commuter or weekend warrior, a pre-ride inspection is a key aspect of maintaining your motorcycle, and keeping your safe. Let’s breakdown the basics of what you need to look for in a pre-ride inspection. Leaking fluids – before hoping on your bike, check ground for puddles or dripping fluid off the bottom of the motorcycle. If you store your bike in the same place regularly, placing a clean piece of cardboard or paper towel underneath will give you a clear indication if any fluids have leaked since your last ride. Engine oil – before attempting to start up the bike, verify that your motorcycle has oil in it. Most modern engines have a clear oil-view window. With the bike upright, verify that the oil level is clearly visible through the window. Roughly halfway to three quarters full in the window is ideal. Tires – give both front a rear tires a good look-over to make sure no gashes or excessive wear spots have developed and nothing has punctured the tire. Tire pressure should be checked every 2 weeks with an accurate PSI gauge. Chain – ensure your chain is clean and well lubricated before riding. There should be roughly 1 inch of play in the chain if you move it up and down between the front cog, and rear sprocket. Throttle and Clutch – verify both throttle and clutch cables operate smoothly and do not stick by turning the throttle to the open position and releasing it. The throttle should return to the closed position on its own. Brakes – give the front and rear brake a good squeeze to ensure there is adequate pressure in the lines. Lights – Verify both headlight and brake/tail light and turn signals are operational before starting out on your ride. These simple, and quick tips will ensure your motorcycle stays in proper working order and will help keep you safe on the road every time you ride. For more tips and information, check out our Rider Tips page! Still have questions? Use our Contact page to get in touch with us today. AK Motors is proud to offer a premier selection of used motorcycles at the best prices to the South Bay Area and beyond! We are conveniently located in Santa Clara, California and are easily accessible to the entire Bay Area. 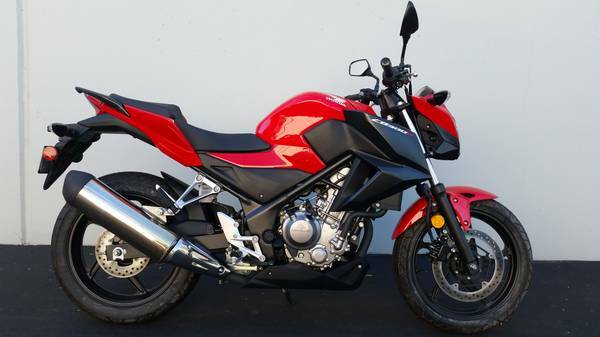 Honda is making a strong bid for one of the single greatest all around starter bikes with its 2015 CB300F. Stylish, efficient, and fun are all characteristics that describe this naked style bike. With an increased power output of 17% compared to its 250f younger sibling, the CB300F offers all the appeal of a compact, nimble beginner bike, with plenty of power to grow into. Despite having all the power needed to ride comfortable on the freeway, riders can expect up to 71 mpg on the 300F. Those who are new to motorcycling will appreciate the low, upright riding position and overall light weight with a seat height of just 30.7 inches and a curb weight under 350 lbs. If you are in the market for a beginner bike, or just looking for an efficient, stylish new ride, you’ll be hard pressed finding an example more mint than this! With just 48 original miles, and the warranty still intact, we’re confident this is one of the best deals you’ll find on a 2015 model. If you’re interested in more information on this or any of our inventory of pre-owned motorcycles in the Bay Area, check out our inventory page! AK Motors is ready to get you set up with financing, for more information please click the Apply for Finance tab, or click here. Looking for a first bike, or just something a little more relaxed? We’ve got you covered! From the beginner friendly Kawasaki Ninja 300, to the dual-sport KLR 650 and everything in-between, give us a call today and set your appointment to get out on the road! AK Motors is conveniently located in the heart of the Silicon Valley in Santa Clara, CA with easy access from all over the Bay Area. Our full contact information can be found here. Full selection of used motorcycles in Santa Clara, and the surrounding Bay Area here! 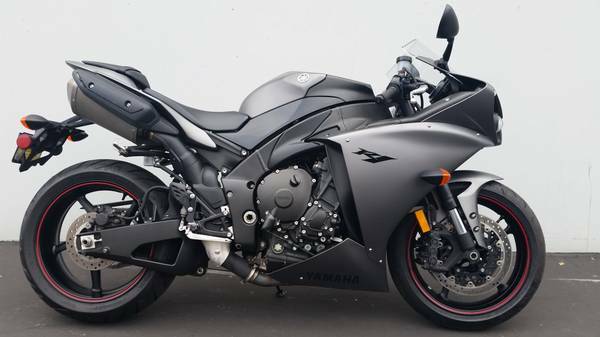 This week, we are featuring a beautiful 2013 Yamaha R1 Crossplane. The R1 hardly needs an introduction, its dual front ram air intakes and under-tail dual exhaust are enough to make anyone aware that this machine means business. Yamaha’s incorporation of the cross-plane crank design offers more low-end pull than traditional layouts and you can ride more confidently in tricky conditions with Yamaha’s simplistic, but effective traction control system. For complete details, and to see our full inventory of pre-owned motorcycles in the Bay Area, check out our inventory page! As always, AK Motors is ready to get you set up with financing, for more information please click the Apply for Finance tab, or click here. Here at AK Motors we stock a wide array of used motorcycles to suit any rider skill levels and riding style. Whether you are looking to purchase your first motorcycle, or upgrade to something with more power, we have a bike that is perfect for you. For beginner to intermediate level riders, we recommend motorcycles with an engine displacement of 250cc-650cc. If you’re looking to get started on your first motorcycle, popular choices include the Honda CBR 250, CBR 500, Kawasaki Ninja 250, Ninja 300, Ninja 500, or the Suzuki GS500. These bikes are lightweight, easy to maneuver, and offer excellent gas mileage. One of the most important factors to consider when buying a beginner bike is the riding position. An upright, relaxed riding position will provide the most comfort, balance, and control for those just getting into motorcycling. If you frequently ride on the freeway, we recommend stepping up to motorcycles in the 500cc-650cc size. Popular motorcycles in this range include the Honda Shadow 600, Kawasaki Ninja 650, Suzuki SV650 and SV650S, Triumph Street Triple R, Yamaha FZ6, and many more. Stepping up to a 600cc or higher engine size will offer far more comfort at highway speeds, in addition to more power for spirited riding. Choices like the Kawasaki Ninja 650, Suzuki SV650 or Yamaha FZ6 offer the perfect blend of an upright riding position with plenty of power for freeway commuting and sport touring. We also carry all the top supersport bikes including the Honda CBR600RR, Kawasaki Ninja ZX6R, Suzuki GSXR, and Yamaha R6. These motorcycles are recommended for experienced riders looking for the most aggressive riding position. The track-focused design of supersport motorcycles combined with high-revving engines make for extremely responsive handling, throttle and braking performance.